At a railway stock yard everyday goods are moved from one train to another by porters driving small electric trains. These are charged up over night and used during the day time. The trains relay on geared systems to propel them along at speeds exceeding fifteen mph. It has been decided to change the gear system in each of the trains to reduce the speed to ten mph. The old and new replacement gear systems are shown below. 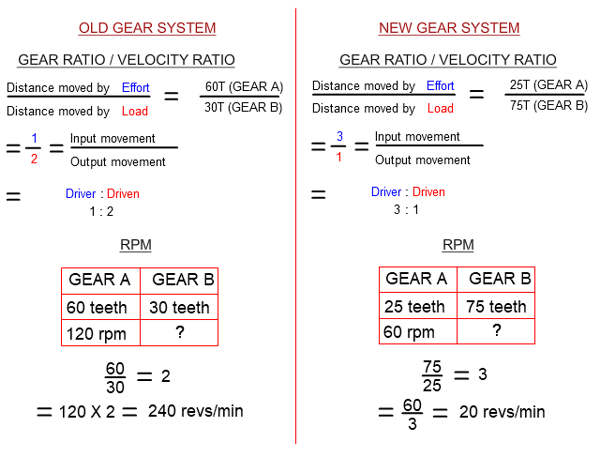 Work out the gear ratio and rpm of gear ‘B’ for each system.